Fans can add 25 episodes of Animaniacs Volume 2 to their classic animation DVD collection starring the Warner Brothers, Yakko and Wakko, and the Warner Sister, Dot so crazy that the studio execs locked them away in the water tower. 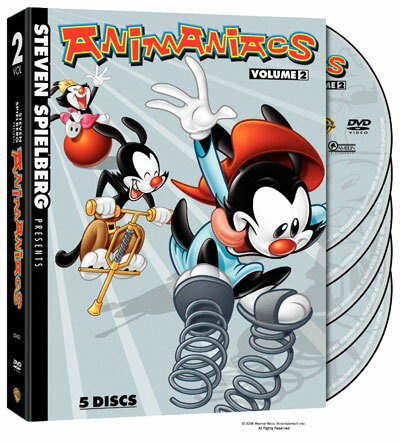 Animaniacs Volume 2 features over nine hours of great entertainment in this five-disc collector's set. Also, don�t miss 22 episodes from the Emmy� Award Winning series Pinky and the Brain as they attempt to take over the world in Pinky and The Brain Volume 2, a fun-filled four-disc collector's set. Each release is priced to own at $44.98 SRP and has an order due date of October 31, 2006. Animaniacs Volume 2, produced by Steven Spielberg, features an ensemble cast of off-the-wall characters who appear in a wide variety of roles as they continuously escape the water tower and run amuck all over the Warner Bros. lot. Warner Brothers, Yakko and Wakko and their Warner Sister, Dot, parody pop culture with their witty, slapstick humor in this must own DVD set for collectors of classic animation. 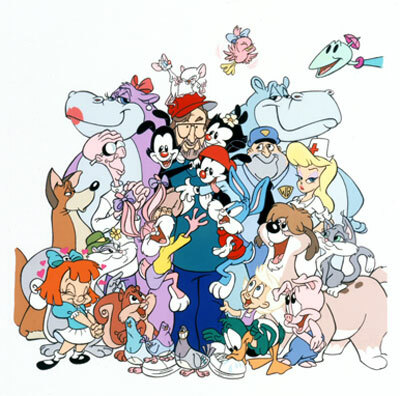 Animaniacs first aired on Fox. The show then appeared on The WB as part of the �Kids WB� afternoon block. The Writer�s Flipped, They Have No Script [Maurice LaMarche leads an amazing gathering of writers on what there favorite Animaniac episodes are that they wrote, and what they think Mr. Spielberg�s favorites are.] Runtime approx 25 min.